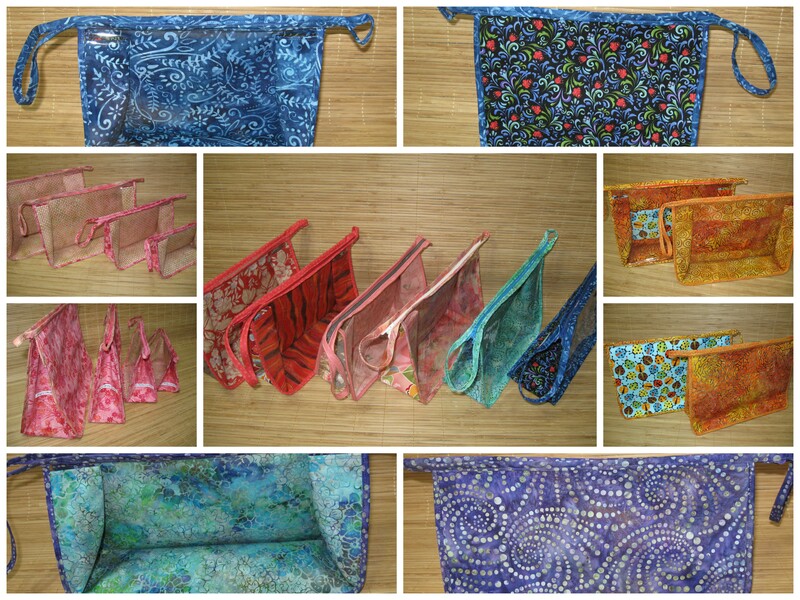 Blog | Pip n Milly Creations | Beautifully practical, one of a kind handbags and gifts. It has been a busy spring chez Pip ‘n’ Milly Creations. Between all the usual family things like school, swimming lessons, gymnastics, gardening, Lego-building, movie-watching, story-reading, bike-riding and more, I’ve continued working on sewing orders, test knitting and doing some of my own knitting. 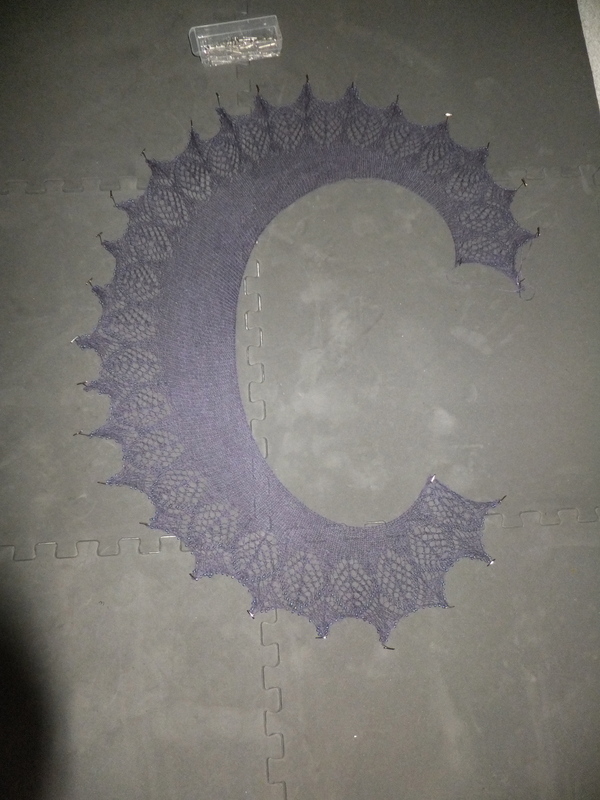 I was also fortunate enough to attend a weekend workshop on Estonian lace knitting with Nancy Bush. What an awesome, inspiring weekend that was! 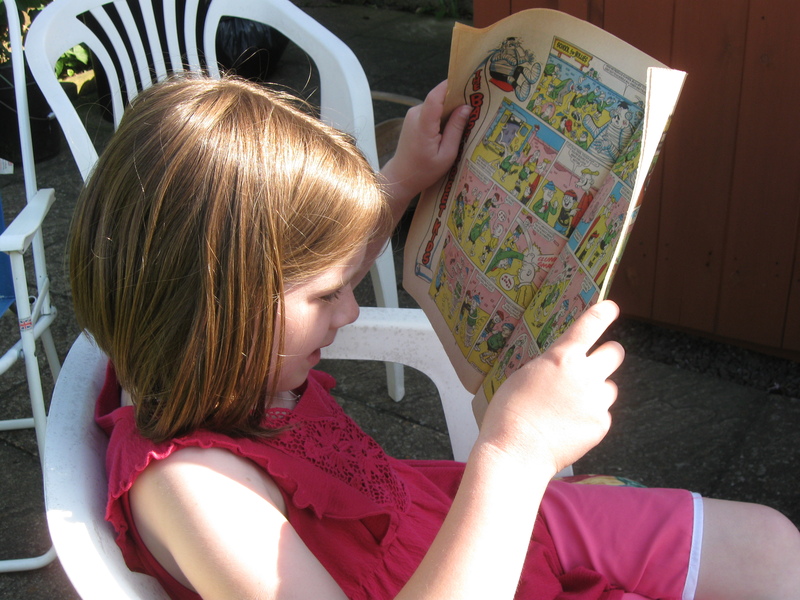 There have been a few birthdays, lots of weeding, tending to chickens and pondering plans for the summer ahead. The immediate plan is to finish getting ready for the 100 Mile Fleece and Fibre event which takes place on Sunday 26th May at the Bradley Centre, just east of Coombs on beautiful Vancouver Island. I attended last year and was instantly smitten. It was the first event where I really, truly felt at home and that I had found my place. Everyone who attends, from the vendors to the visitors, is passionate about fibre, textiles and handmade. They really ‘get’ what it is all about. It was a fantastic experience to be surrounded by so much energy and enthusiasm. I will be bringing a selection of my fabulous, unique, one of a kind project bags in small, medium, large and jumbo. 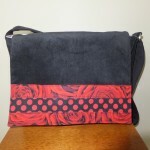 Of course, I am always happy to take custom orders for project bags, messenger bags, handbags etc. Gift certificates are also available. So – you really should plan on coming to the show! Hope to see you there. The Mid-Island Weavers and Spinners Guild is hosting their biennial sale event tomorrow, March 16th, from 9.30am to 1pm at St Paul’s Anglican Church, 100 Chapel Street, Nanaimo. 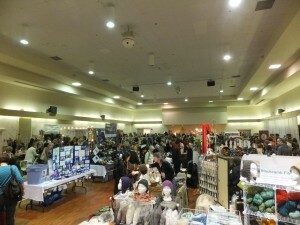 There will be a variety of vendors selling everything from fleeces, fibre, books, equipment to handmade products such as artisan soap, bags and more. Pip ‘n’ Milly will be there, with a selection of one of a kind project bags. As most of you know, the majority of my work is made to order, but a couple times a year I attend a show like this. 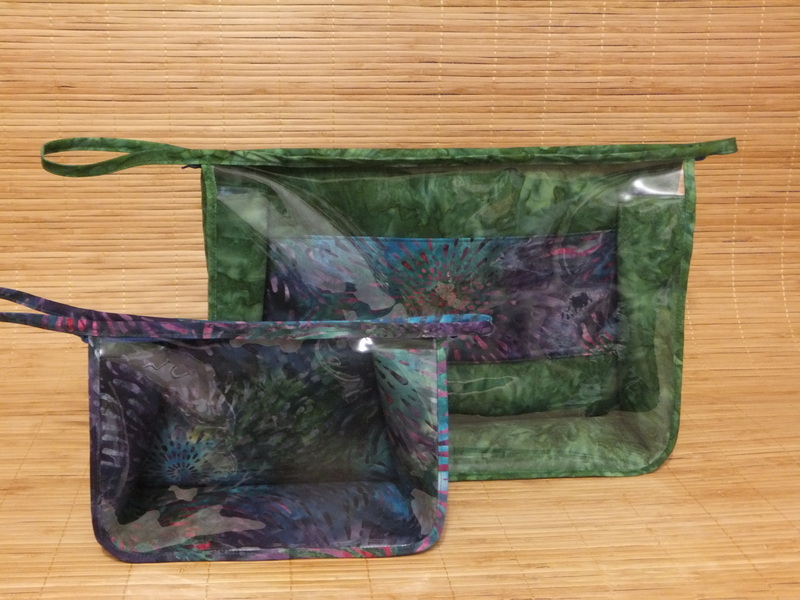 I love the feeling of community – and the opportunity to enhance my own stash! Today I am reminded how grateful I am for the fact that the local malls host trick or treating. The weather is absolutely dreadful right now and going door to door would be a wet and miserable experience – for me, if not for the children! So, they set off this morning in their costumes (one made by me, one purchased – moderation in all things, I say!) and will be having a day filled with fun, candy and not much school work. We’ll have a quick run around the mall, admire all the creativity, then head to Grandma’s house, where she will have decorated for our own private party. 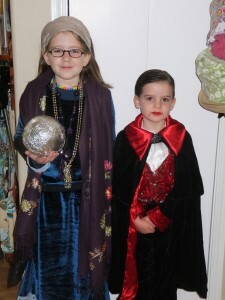 She loves to put on a spooky spread, dress up and transform the living room. We love her enthusiasm! 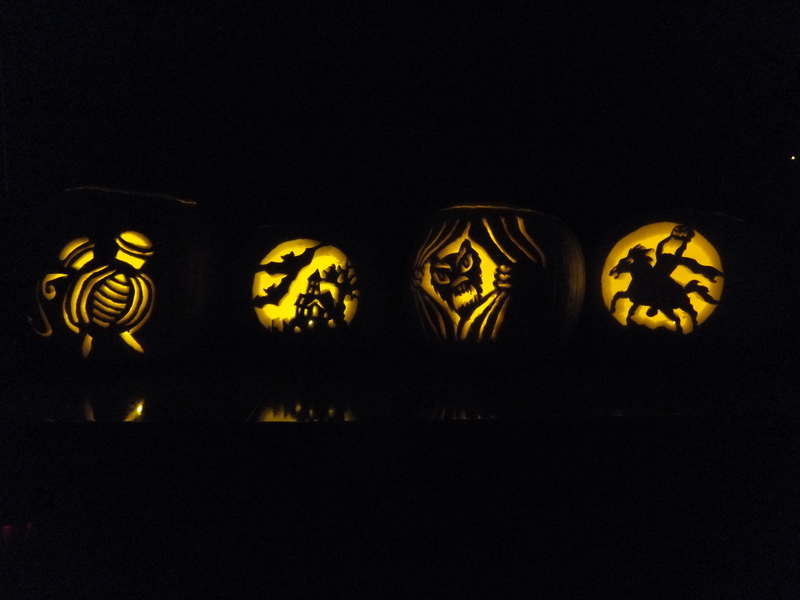 My favourite part of Halloween is probably carving pumpkins. I wish my artistic abilities were up to the task of freehand-drawing my own designs, but alas, no! 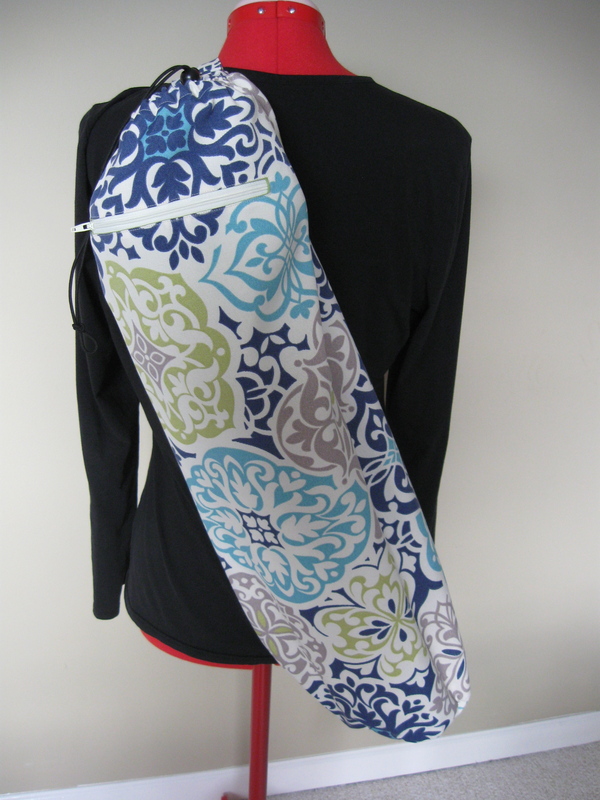 I use patterns and a carving kit – much easier and safer than a kitchen knife. 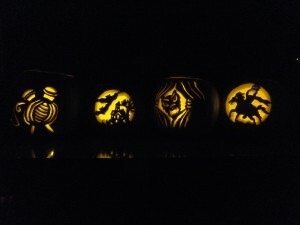 Of course, Halloween is not the only thing that has been going on around here. I’ve been working on custom orders for handbags and project bags, and knitting a couple of hats to be sent off to our niece in England. 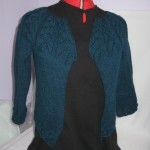 I’ve also just started on a test knit for Lynette Meek, which will become the next knit-along on Ravelry. 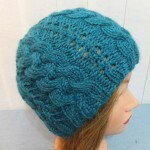 I always know that I will learn something new from Lynette’s patterns and this is no exception. It is going to be stunning. How can it not be, with camel/silk yarn and shiny beads?! If you are up for a challenge, check out Lynette’s previous KALs – Dark of the Morning and Roses, Roses. Beautiful, beaded lace designs that are seriously impressive. This is the bag I just finished for a returning customer, a black shoulder bag with a bright and beautiful interior, pockets and a key clip. My project bags continue to be popular and would make a great gift for the knitters in your life. 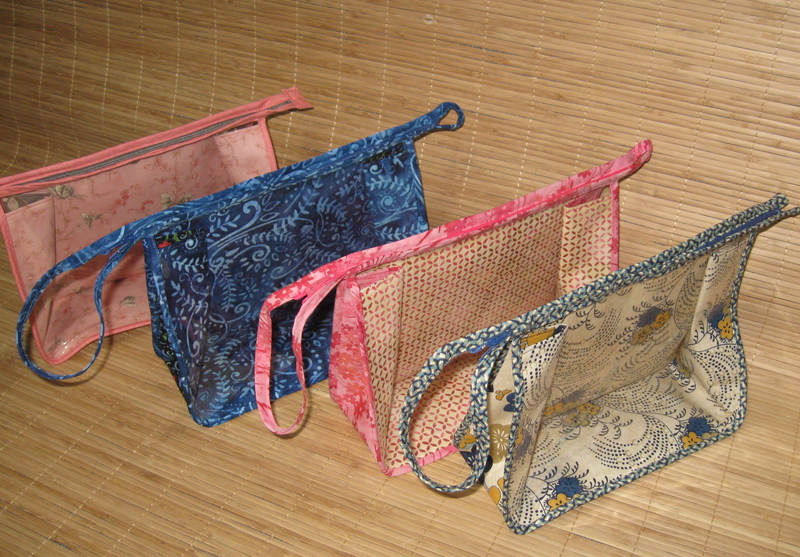 One can never have too many project bags – and I am speaking from experience! I’ve increased the depth of the gusset, so that skeins of yarn, wound into balls, will sit nicely on the bottom of the bag. 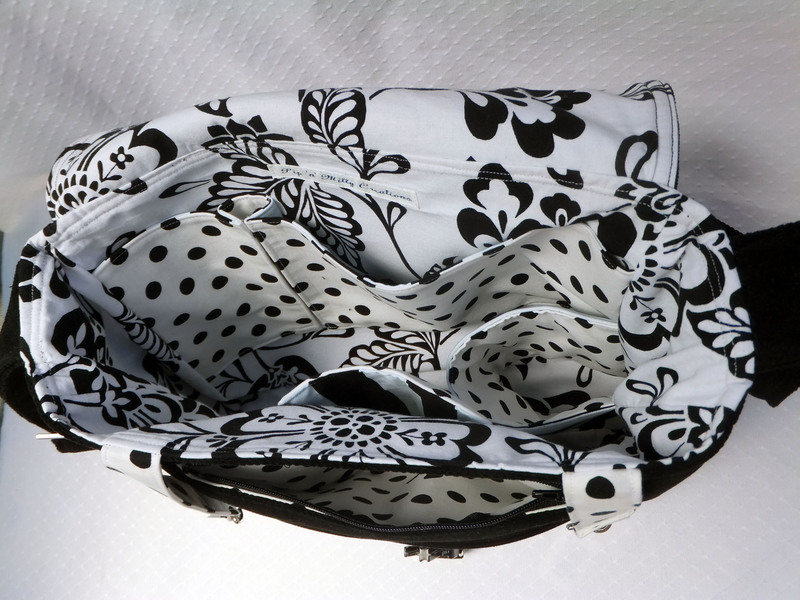 The smaller gusset is still available for those who tend to buy or use the smaller balls. 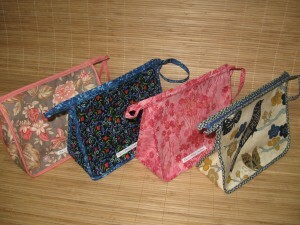 The two in the photo are special order bags with needle pockets. 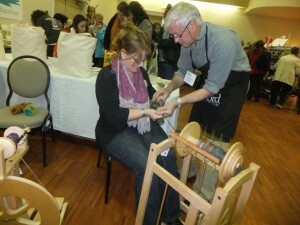 When I heard that there was going to be a fibre festival in Vancouver, I was pretty excited, as you may imagine. 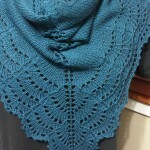 When I found out that Kate Atherley (wisehilda), Kim McBrien (indigodragonfly yarns) and Felicia Lo (SweetGeorgia Yarns) were going to be there as well, I was doubly excited and started planning how I was going to make it happen. Initially, I was going to go over just for the marketplace on the Saturday and head home again. Now, we live on Vancouver Island, a 1.5 hour ferry ride and 45 minute bus ride away from Vancouver. The venue was further away than that, so I/we would probably be on the first ferry in the morning and be heading home on the penultimate ferry. All doable so far. Then I heard about the Kick-off party planned for the Friday night, where vendors, attendees, volunteers would be gathering for some pre-show relaxation and to hear talks by KP Werker and Sylvia Olsen. How could I not go to that?? So then the planning began! 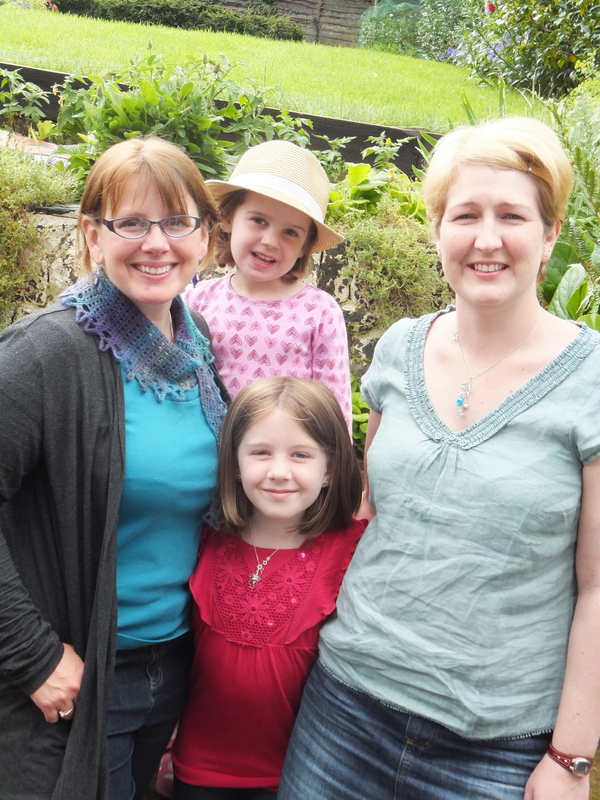 We have two young daughters who were delighted with the chance to stay with grandma, and she was happy to have them, even though her best friend in all the world was arriving from England on the Saturday afternoon. You might begin to understand my excitement about all this when you know that I test knit for Kate and Felicia, communicate with them on Twitter and had never met them in person. I knew they would be really busy during the show itself and this would be a good opportunity to meet them – and ask Kate to sign my copy of her book! I know, I know, it’s all a bit fan-girl! There was also the fact that I had borrowed Sylvia’s book, Working with Wool, from the library three times in a row and I really wanted to hear her speak. Better yet, if I could get hold of a copy of her book, I had a wonderful Christmas present sorted for my Mum! I was also very keen to meet Kim from indigodragonfly, as I have been coveting her yarns. There were many other people that I wanted to see, but these four were what spurred me on. To cut a really long story short, my husband and I headed over to Vancouver for the party and to attend the marketplace on the Saturday. I took 4 hours to get from our house to the hotel, where we rested briefly before heading out to Commercial Drive to the venue, which was much larger than I had expected. I was very glad he was with me, as I don’t know Vancouver at all and my days of travelling around a big city are long behind me. Of course, being very keen, we were a bit early, but it turned out I knew one of the volunteers and also got to talk knitting with other people that were there. 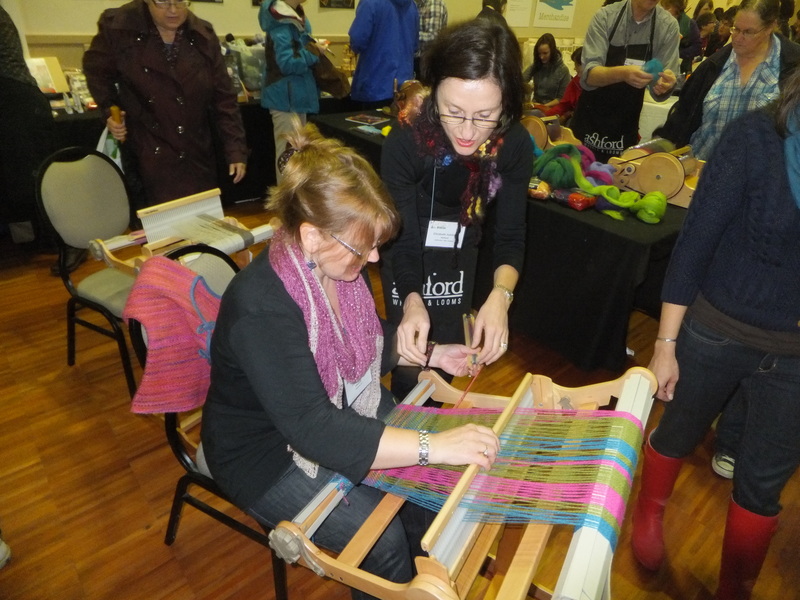 The talks were excellent, the turnout was fantastic and it was wonderful to be in a room full of people who share my passion for fibre and yarn and making things with it! The fabulous Amanda and Fiona, the organizers of the show, went above and beyond in helping me get hold of a copy of Working with Wool through Baaad Anna’s, a yarn store in Vancouver. Sylvia signed it for me and I can hardly wait for Christmas now, so I can give it to Mum, who will be as thrilled as I was! I know I am name dropping, but over the weekend I met Kim McBrien, Felicia Lo, Kate Atherley, Kim Werker, Sylvia Olsen, Amanda and Fiona, Jane Richmond, Shannon Cook from luvinthemommyhood, Trish Moon from Indigo Moon Yarn, Richard and Elizabeth Ashford (!! ), Liz Abinante aka Feministy, plus many other warm and wonderful people. I wish we had taken more photos, but I was too excited and taking everything in to really think about that! We even arrived early enough to get the ‘swag bag’ available for the first 50 people through the door! Yes, my husband is truly wonderful for his support and … endurance! 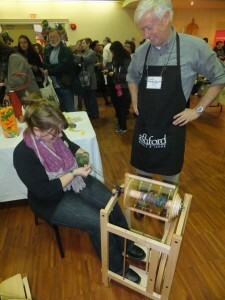 Richard and Elizabeth own the company that makes the world-renowned Ashford spinning wheels. 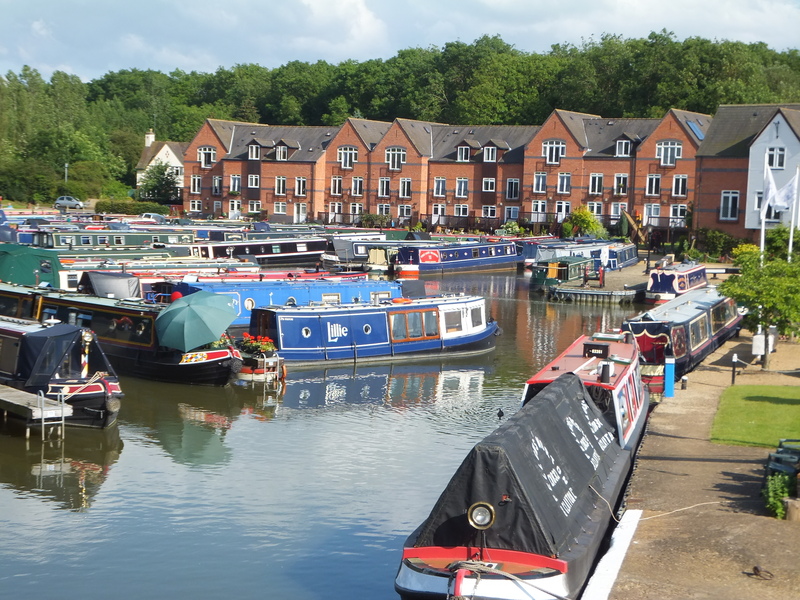 I’m the proud owner of an Ashford Traveller, so it was a real delight to meet them both. Richard was demonstrating a wheel that is for spinning very bulky weight yarn and asked if I wanted to try. I normally knit with laceweight, so that is what I spin. Trying to spin bulky is not so easy after months of spinning very fine yarn, but I tried! You may notice that I am wearing a particularly lovely shawl. It was the Roses, Roses wrap designed by Lynette Meek and this was its first outing, after being on display at Mad About Ewe. It is a truly beautiful piece and I was really proud to be able to show it off. All in all, it was a fabulous outing and I’m already looking forward to the next one. I might even take a class next time, but for now, I’m heading to my happy place next to my yarn collection! Anyway, the general point was that we spend our lives rushing from one errand or project or appointment to the next and don’t often have – or take – the time to sit back and contemplate all that we have done. Since I injured my back, I am getting a little better at considering things, rather than rushing headlong into whatever idea has popped into my head. This doesn’t always translate into knitting, as I want to knit all the things! It does mean that I don’t do as much gardening as I used to and I don’t automatically move boulders anymore! 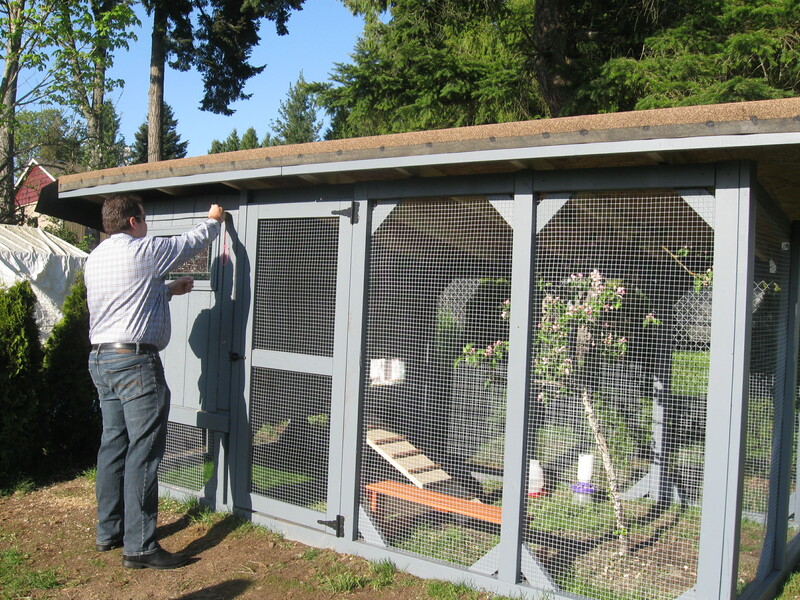 My husband spent months researching chickens and chicken coops before he designed and built a beautiful coop and run for our three heritage breed chickens. 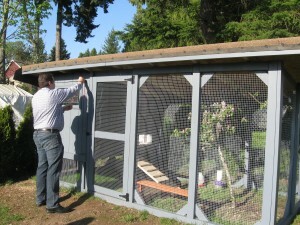 He (we) did a fantastic job and they have a great home and are happy healthy birds. 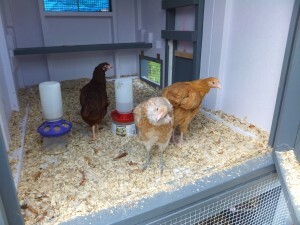 They are Willow, a Buff Orpington; Leia, our Ameraucana; and Padme, a gloriously glossy Rhode Island Red. They are reliable layers and we get three different colours of egg from them – and haven’t had to buy eggs from the shop for months. We might have to over the winter, as they will lay less then. Did you know that chickens love grapes and melon? 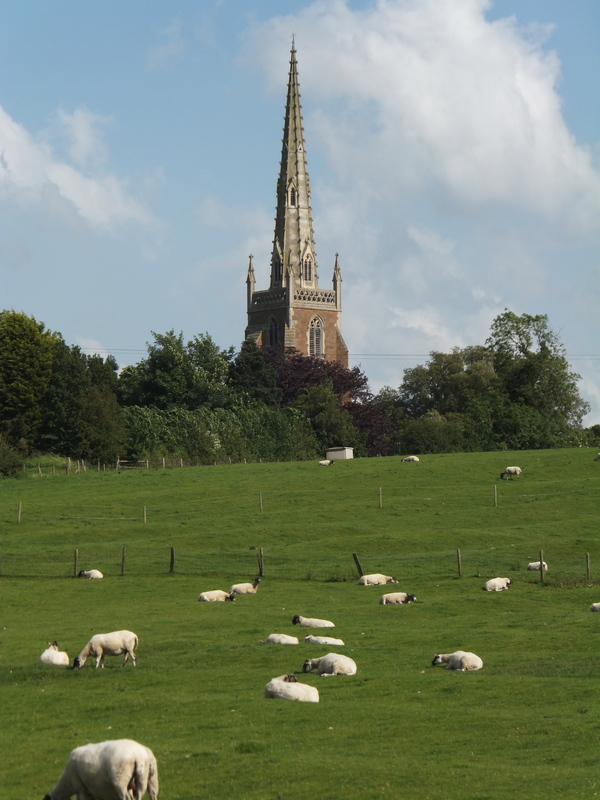 We had a pretty fabulous, but brief, trip to England earlier this year, but we weren’t able to see all the family, so we’ve kept quiet about it. It was our first trip in 7 years and we needed to spend time with certain people and relax as much as possible. It was an important trip for the girls, as they are both old enough to enjoy and remember it. Here are a couple of my favourite photos. Lol! How could I not include a photo of the bag I made myself for our trip, along with the shawl I knit to coordinate with the bag! I spent more time considering what knitting I was going to take than I did packing everything else! 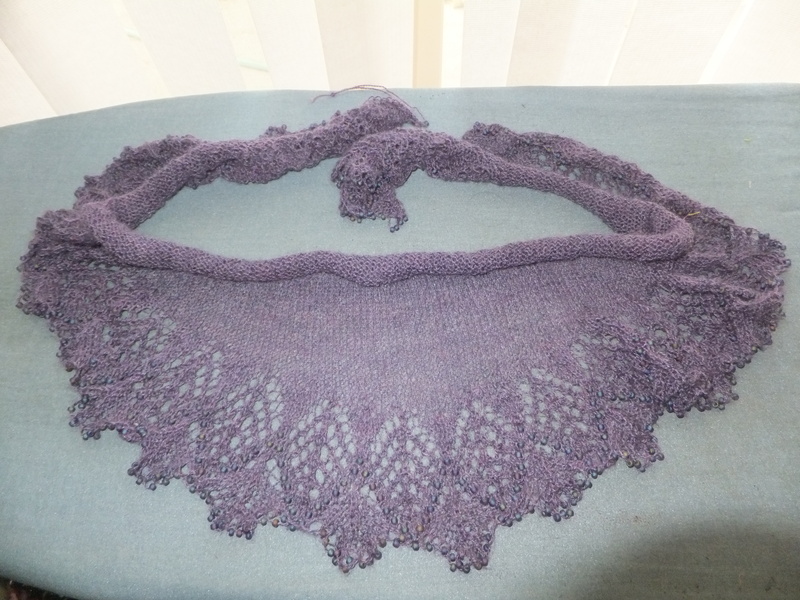 Whether I would be able to knit on the plan was also an issue – I was able to knit all the way there, but not allowed to carry knitting on the plane for the return journey. 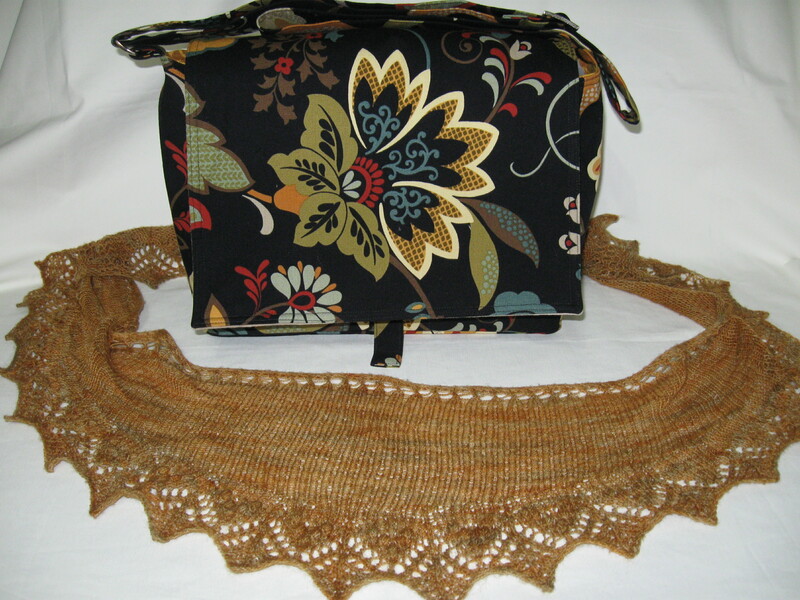 The bag is, of course, one I designed myself and the shawl is Annis by Susanna IC, one of my favourite designers. 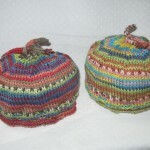 This was the first time I had attempted nupps – tricky at first, considering you have to purl 7 stitches together! 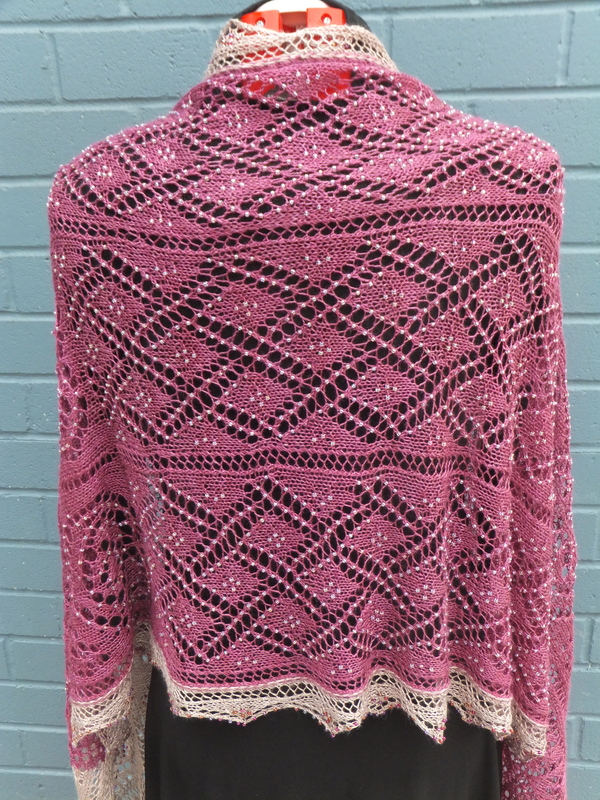 When we got back, I got straight into test knitting for the fabulous Kate Atherley, whose new book will be out sometime this fall – with my name in it!! The girls dismissed it as ‘only a knitting book’, but I’m still pretty excited about it. 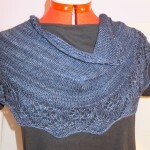 Some of my knitting has also appeared in Vogue Knitting, which I am completely thrilled about. Imagine how excited I will be if I ever get in it as a designer! Doing this post has made me realize how much has happened over the last few months! It is almost time to make the morning tea, so I’ll leave it there and post a little more later, as I haven’t even reached the jam-making yet! 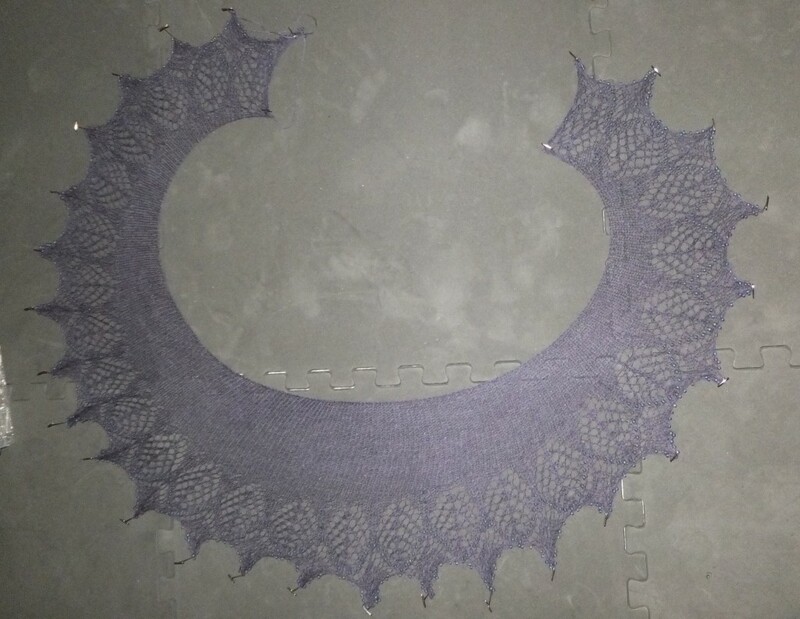 When I first started knitting last year, I had no clue what blocking was or how to do it. Essentially, blocking means soaking your finished piece, then shaping in out to the proper size, pinning it in place and allowing it to dry. 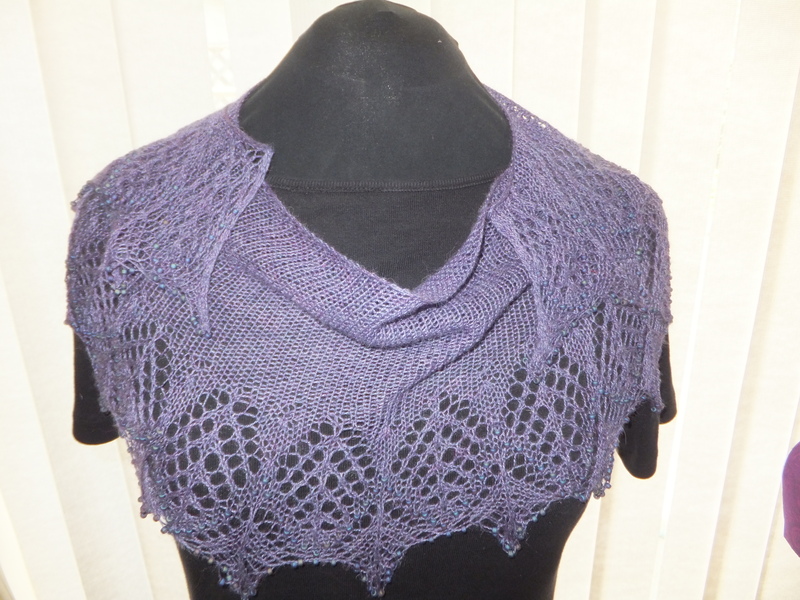 As I mostly knit lace, blocking is crucial in that it opens up the lace patterns to display them to full effect. 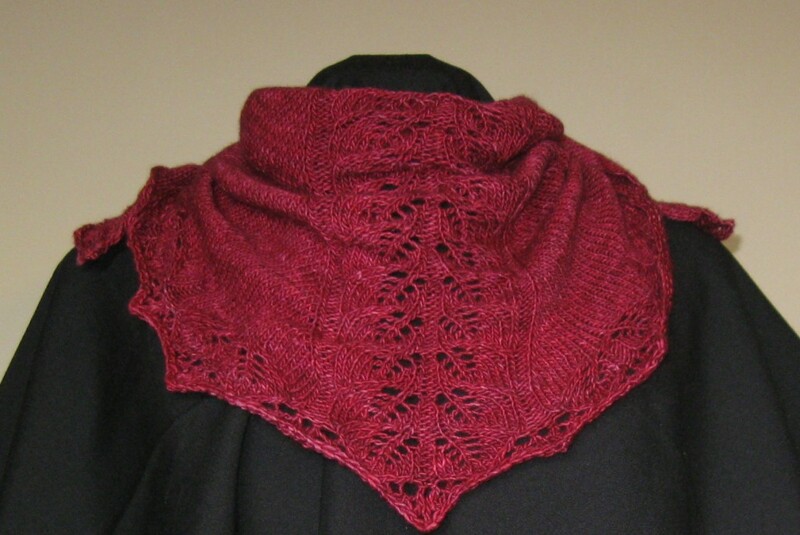 I might skip blocking for a toque/hat, but never for a shawl or scarf. 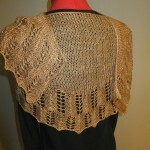 Here is a quick example, starting with a photo of what the piece looked like as I finished knitting it. 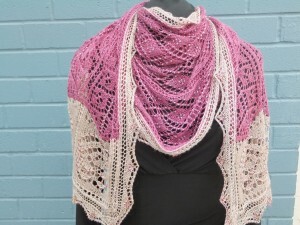 This is Abrazo by Susanna IC, a designer of many beautiful lace projects. 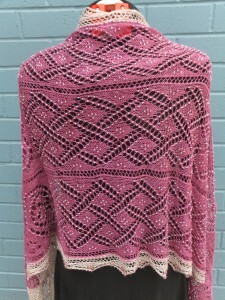 I knit this for a friend, using a baby alpaca/mulberry silk blend and frosted glass beads. I soak my projects in warm water, with a little bit of Eucalan. ‘Soak’ is another no-rinse wool wash that comes highly recommended. This next photo shows how I blocked it out on foam mats from Costco. I bought this set of mats, as it has 8 mats, rather than the 4 I was using previously. It allows for greater flexibility and having them all the same colour, rather than the multi-coloured set I had before, makes for less distraction if I want to take a picture of my project at this stage. 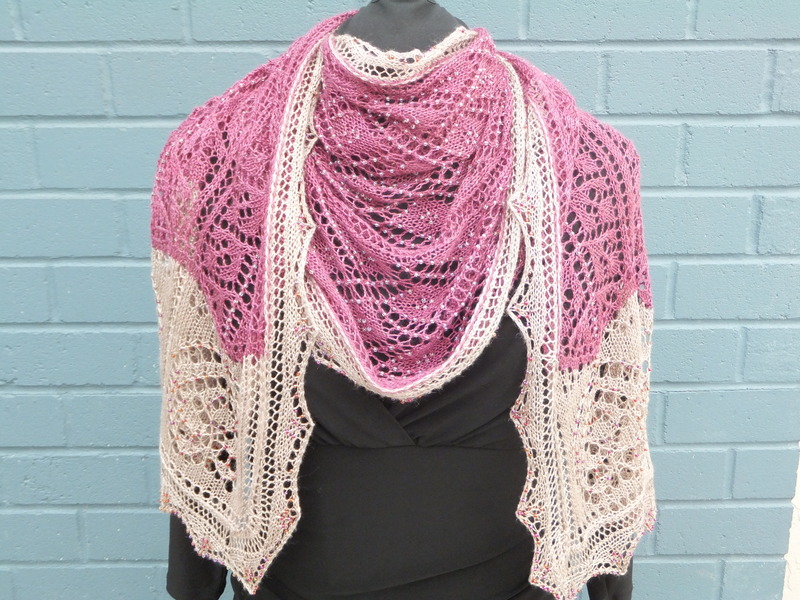 Here is the finished item, ready for the lovely Isabel, who has been so very kind in welcoming me into her home and sharing her fibre-y knowledge. Another year is winding down has wound down and I’ve put all other hand-occupying things aside to try to put together a post to fill in a LONG, quiet period! What to say? Well, I might just work backwards this time and wish you all a belated Merry Christmas AND a Happy New Year! I hope the pressures of the season were light, your joy great and that you were able to spend time with the people you love most. We had a wonderful, fun and mostly relaxing Christmas. We don’t have an extended family here, just the four of us and my Mum, but my younger brother surprised us all by arriving the week before! He had been travelling in Borneo and it was our great good fortune that he decided to come spend Christmas with us. The girls have been unbelievably excited to have their uncle here, especially one who is so good at playing crazy games, being silly, eating endless fake food etc. His arrival was particularly good timing, as I had ‘spinal decompression surgery’ on December 21st. The girls had to stay with Mum and my brother while we travelled to the city where the neurosurgery unit is located. Many of you will know that I have been suffering from the effects of a herniated disc for nearly three years. It has been utterly debilitating at times, a little less at others, but unrelenting in all that time. My sewing chair has been a refuge, as it caused less pain than other seats in the house. We finally found a chair I could sit in and I have spent time sitting with the family – or more often than not, laying on the couch, falling asleep! Anyway, to cut a long story short, I had the microdiscectomy surgery on December 21st to remove the herniated material. The operation was a success in terms of alleviating the pressure on the sciatic nerve. Time will tell whether I will regain reflexes or normal skin sensation after years of damage to the nerves. The post-operative pain was immense, but is improving day by day. I think 2012 will be an awesome year! ETA There is still some pain in my backside and hip, particularly at night, but all in all I am feeling much better. 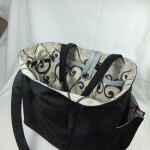 I have continued to design and sew and have participated in select events throughout the year, most notably The Treasure Chest series, run by Kate and Brooke of Hudson & Saige. These local business fairs feature a range of high-quality, locally owned businesses and I’m proud to be a part of their continuing presence in the Nanaimo area. 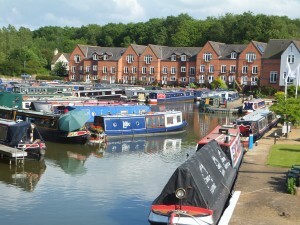 It has been wonderful to meet new people and share the Pip ‘n’ Milly vision. It is pretty exciting that a number of Pip ‘n’ Milly products will have been unwrapped in the last few days! 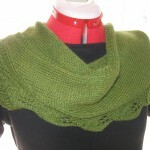 My personal goal for 2011 was to learn to knit properly. I’ve been able to do very basic knit/purl rectangles since I was a child, but was stumped by the complexity of patterns and the secret language of knitting abbreviations. No longer! I started in February and am genuinely thrilled with how much I have learned. I see no end to this passion, which is a good thing, as I have accumulated a large stash of needles, yarn, fibre, notions and a never-ending list of things I want to make. Knitting is, for now, mostly a selfish pursuit, as I knit for myself. If sewing is time-consuming and labour-intensive, knitting is doubly so. However, I did knit a beautiful pair of socks for my brother for Christmas, to help him cope with the change in temperature from Borneo to the West Coast of Canada. 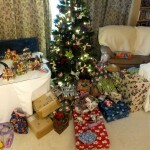 Included in the photos are just a few of the things I had the pleasure of making in 2011. 2012 has been a great year thus far. While I struggle to think of things to write for blog posts, that struggle does not extend to actually making things. I have continued knitting and sewing and have now added spinning to my fibre passions. It is something I have long wanted to do, but I guess the timing wasn’t quite right before. I am now the proud owner of two spinning wheels, which were purchased from long-time spinners who have bought new wheels. I have an Ashford Traveller from New Zealand and a Canadian made Lendrum. No doubt I will be posting about my yarn-making endeavours in the future. However, I would rather be doing it than writing about it, so I’m off to ply some singles now! The weather has become decidedly autumnal – and by that I mean that it is chilly and raining. 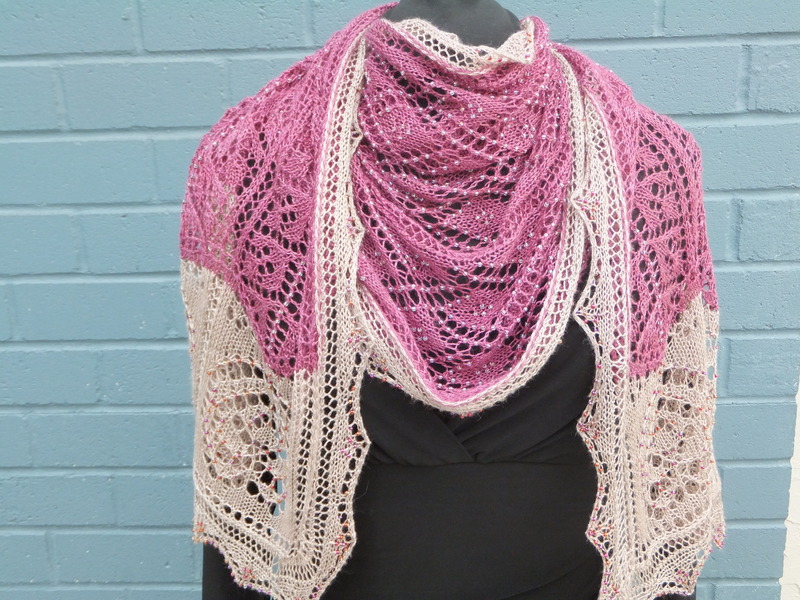 The upside is that I can definitely justify wearing the results of my knitting challenge – scarves, shawls, hats and gloves. As it is “Socktober”, I really ought to be working on some socks, but I have so many other projects on my needles at the moment that the socks will have to wait. I’m doing another test knit for a designer at the moment (third designer, fourth project), so my own projects are languishing in their respective WIP pouches – which, incidentally, I need to make more of! This is ‘Dolcetto‘, designed by Dani Berg and featured in the Fall issue of Knitcircus magazine. 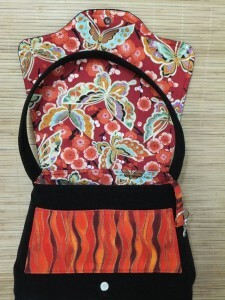 I was fortunate enough to win the pattern collection and started with this beauty. 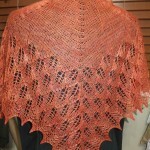 I knit it in Madeline Tosh ‘Toshlight’ in the Vermillion colourway. I have also knit a couple of purple hats for the Click for Babies Purple Cap Campaign to raise awareness of shaken baby syndrome. 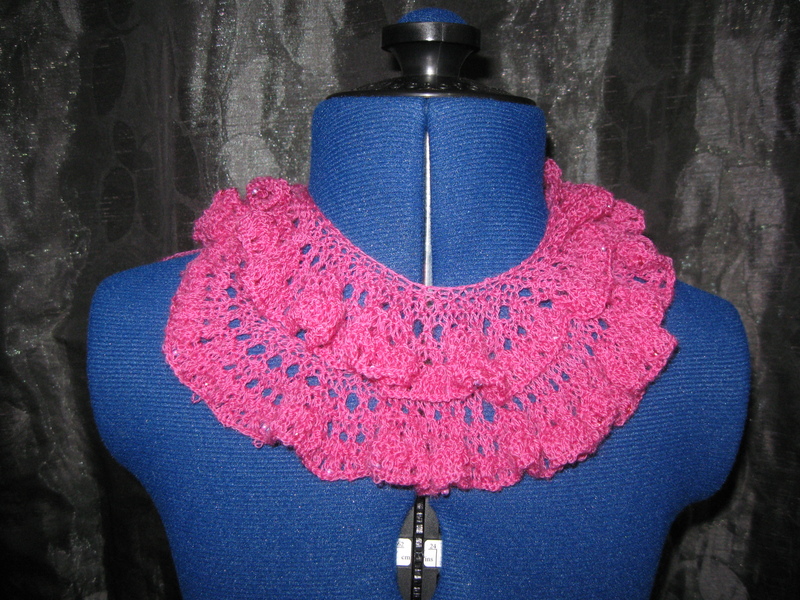 In order to compensate a distraught child after she realized we had sold the play kitchen, I knit this lacy, ruffled scarf with beaded cast off in a really soft, pretty yarn. Did she know about selling the kitchen (two months ago)? Yes. Has she worn the scarf yet? No. 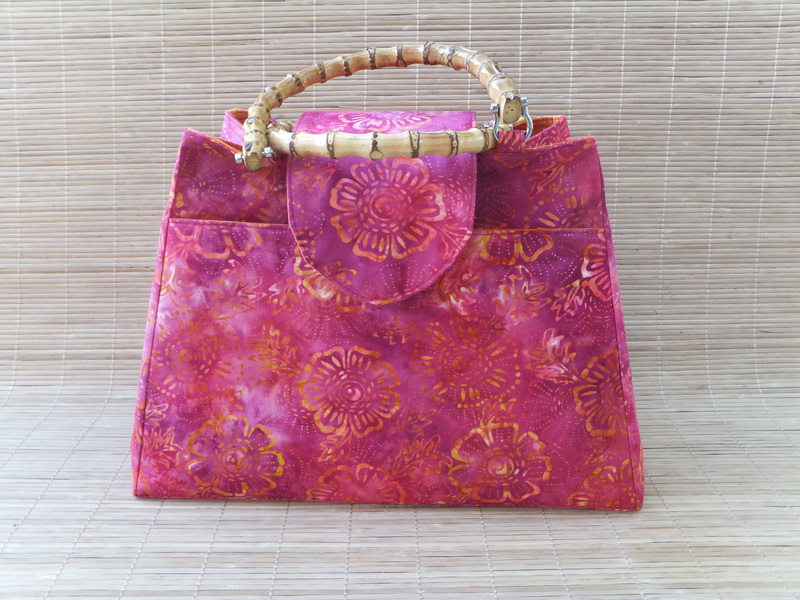 I have actually done some sewing, too! Here is a large yoga bag I made for someone who has trouble rolling her mat tightly enough to fit in a regular yoga mat bag. 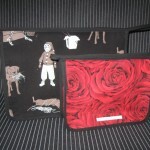 These two shots are of a custom order messenger bag. 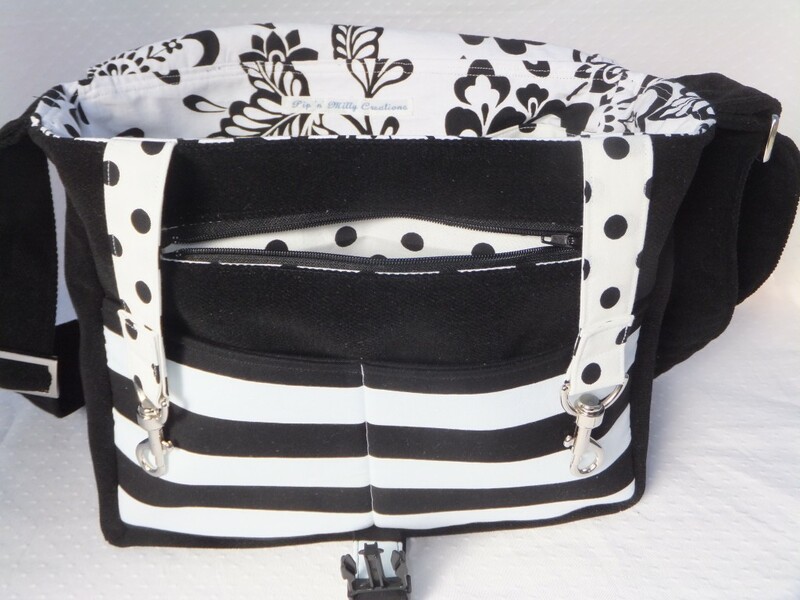 The exterior is plain black, but in a beautiful, soft, yet heavyweight fabric, whilst the interior is in a combination of black and white prints. The lack of vibrant colour is a bit of a departure for me, but I think it is fabulous and the new owner is delighted! 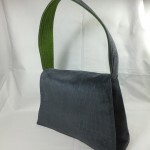 The bag has an adjustable strap with the new deluxe hardware, a side release clip closure and padded pockets and a zippered pocket under the flap. 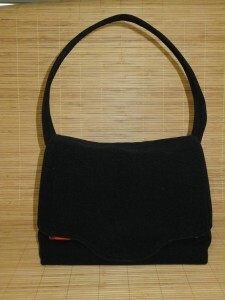 The interior features two key clips, a cellphone pocket and expandable pockets for the particular things this lady carries. 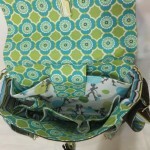 It also has a water bottle holder and a magazine pocket on the rear of the bag. I will be participating in the Treasure Chest Christmas Extravaganza at the Costin Hall in Lantzville on Saturday, 3rd December. It will be a fabulous event and we will be partnering with the Child Development Centre in our “Share the Magic” campaign! We will be collecting donations of unwrapped toys, clothes, and other gift donations to share with families of the Child Development Centre. Admission and refreshments are free and there will be a great selection of quality vendors. Mark it on your calendars and come join in the fun!